Act I. - The interior of Hobson’s Bootshop in Chapel Street, Salford. Henry Horatio Hobson, a Salford tradesman, imagines that he can impose his choice on the world at large, including his family. 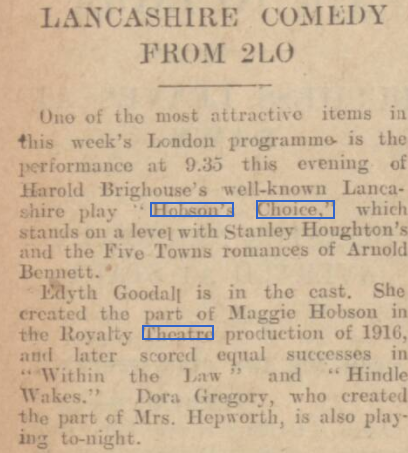 But Maggie, his equally uncompromising, but much clearer-sighted, daughter, succeeds in convincing him, and everyone else, that ‘Hobson’s choice’ is Maggie Hobson’s choice. From The Western Morning News - Monday 11 June 1928.